"Is Eyestrain robbing your eyes of youth? Our 1929 ad for bringing attention to the dangers of eye fatigue"
It’s not just laptops and handheld devices causing the problem. Sometimes the technology that solves one vision problem creates another one. A recent survey shows that 92% of contact lens wearers experience eye fatigue at least once a month, and two-thirds suffer from it weekly. People who rely heavily on digital devices are the most vulnerable. 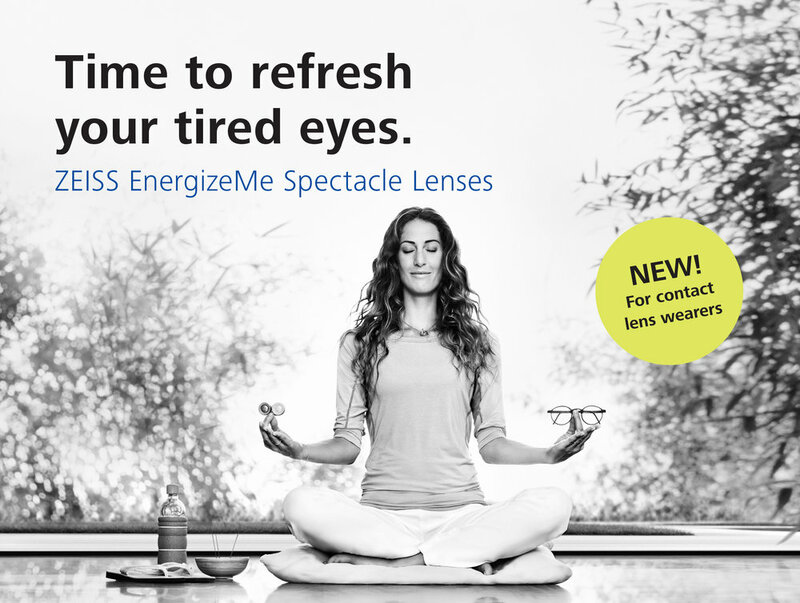 "The new ZEISS EnergizeMe Spectacle Lenses for contact lens wearers - keeping your eyes fresh after a long day"
But even before these technologies existed, consumers sought out ways of correcting their vision with less pain and suffering. Recently released images and documents from the Optical Heritage Museum in Southbridge, Massachusetts, many of them unseen for decades, testify to the longstanding quest for relaxed vision. These materials come from the archives of American Optical, now owned by international optics manufacturer, ZEISS, a company behind many of the most important eyewear innovations of the last 150 years. “Back in the 1920s, the cutting edge technology for tired eyes was the Tillyer Lens,” explains Zeiss Vice President Karen Roberts. “This represented a breakthrough in optics with greater clarity, especially in the periphery of the lens.” Wearers immediately noticed the benefits. They squinted less and suffered less eye fatigue. 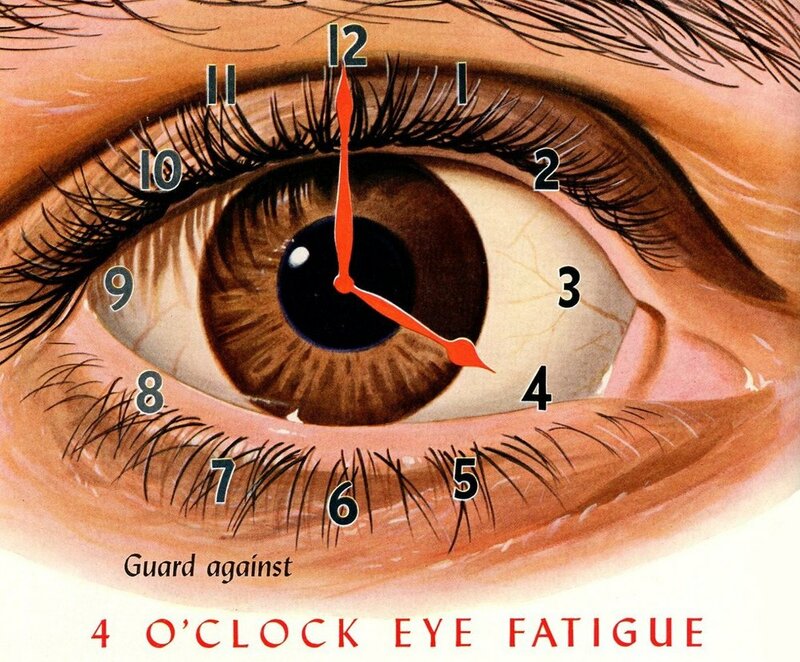 "Guard against the 4:00 eye fatigue - the 1944 precursor to the EnergizeMe Lens"
"Pilot Nick Mamer commented on the relaxing qualities of our lenses during his record breaking flight in 1930"
Even in the 1920s, people were worried about staring into screens—only back then it was the movie theater screen. In 1927, American Optical shared reassuring words from Dr. Charles Reid, the former President of the American Medical Association, who told the public that they could watch films without ruining their eyesight. But Dr. Reid’s research had an interesting twist: he found that patients suffered just as much eye fatigue from reading as looking at movies. “It’s not the pictures—it’s the eyes that are faulty,” Reid announced, and reminded his readers that almost any overuse of their vision would lead to discomfort. Public awareness campaigns from the past often warned that squinting would cause unsightly wrinkles. “Is eyestrain robbing your eyes of youth,” announced an American Optical advertisement from the 1920s. A more comfortable pair of glasses, it promised, would help “banish age lines, puckers and crows’ feet due to eyestrain.” Another campaign called attention to the “4 o’clock eye fatigue” syndrome—surprisingly similar to the current-day experience of many contact lens wearers, who switch to glasses in the late afternoon. But the annals of eyecare history aren’t just filled with complaints about wrinkles and headaches. Sometimes there are even success stories. An article from 1930 includes testimonials from pilots Nick Mamer and Art Walker who caused a sensation by flying non-stop for 7,200 miles, a world record at the time. Mamer sent a letter to American Optical, thanking the company for its eyeglasses. “I found them restful to my eyes,” he declared.